The widely celebrated digital revolution has changed how we communicate, how we develop ideas and how we make things. For manufacturers, connectivity, sensor-supplied real-time data, advanced analytical engines and production automation combine to redefine the whole product delivery process from product development through product sales and even supporting installed products. How Has Connectivity Changed Manufacturing and Selling? For many years, the notion of manufacturing products on demand has been seen as a highly desirable way to ensure that manufacturers operate profitably. This notion replaced the much older mass-production practice of manufacturing large inventories of product to take advantage of economies of scale to reduce costs. This has had a profound effect on how we go about selling products. In the push world of selling, all that “low cost,” mass-produced inventory was brought to market with a goal of emptying the warehouse by year’s end. In the end, Sales would take whatever they could get to move the product out and make room for next year’s products. As the concept of “demand-driven” manufacturing took hold, companies learned how to more accurately identify and separate tire kickers from buyers and to predict sales volume. Data from the sales pipeline or funnel informed inventory and supply replenishment processes as well as reserved slots in the production schedule. In both of these modes, the sales rep was responsible for finding and qualifying opportunities, uncovering prospect pains and needs, matching those elements with product features and benefits, and ultimately building a business case for buying their product. This mode of selling, while certainly not extinct, is giving way to a new selling and buying methodology that is largely technology-driven. At the same time, the role of the sales rep has been redefined. The new role for Sales is elevated to chief custodian of the relationship between manufacturer and buyer. Sales will need to build and maintain an environment of trust and value delivered. This means that sales reps will need to become involved with customers at a much higher level than merely overseeing a transaction. Sales will be the human face of the manufacturer and seller, but transactions will increasingly take place online without human involvement. Large, complex products generate our power; regulate our environments; move us and our goods around the planet; store, handle and communicate our information; and they manufacture our products for us as well. What is new is that many of these complex products are now equipped with all manner of sensors that collect usage information, consumable supply data, performance status and fault-condition data. This data is then communicated to the vendor or manufacturer, which triggers actions such as shipping replenishment orders for consumables, shipping replacement parts prior to part failure or parts nearing the end of their useful life as defined by cycles completed or age. Service visits are also scheduled to install replacement parts and perform preventive maintenance. None of these activities require the personal intervention of Sales, and in many cases, the transactions are totally automated. Supplies are shipped, invoices are generated and payments are received. In the C2B arena, e-commerce solutions are integrated with product configurators to facilitate the custom configuration, pricing and sale of complex products to buyers without the intervention of a salesperson. This is increasingly becoming the norm in the B2B world as well. The journey to this automated lights-out selling environment requires companies to invest heavily in analytical and business intelligence (BI) systems. Product-based sensors deliver prodigious amounts of data over a very short period of time, and learning to quickly and efficiently sift and separate the useful from the useless is critical. Data marts or data-warehousing products are essential to managing the volume of data generated. Different operations within the manufacturing enterprise will need to access different data and refine the data into information that is useful for their specific needs. Analytical engines can feed sales applications, product management and engineering functions and product support functions with individual distillations of data that is relevant to their needs. For prospects and customers, the online user experience is key to building confidence in the vendor and the products offered as well. E-commerce sites must provide query capabilities that help the customer quickly home in on the information, solution or product they are seeking. 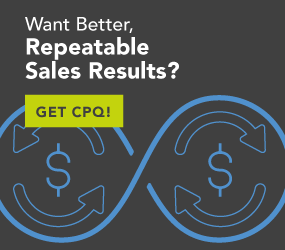 As the customer transparently accesses CPQ systems to configure or design a potential solution, they will benefit and expect some visual representation of what it is they are building and buying. All of this is aided with customer portals that provide the personalization of customer dashboards that reflect the individual customer’s interests and relationship with the vendor. Selling has always been about relationship building and positively interacting on a human level. Sales will still be needed to set up and maintain the relationships that facilitate the data-driven automated selling processes described above. Selling is much more about delivering value, establishing trust and anticipating customer needs and much less about taking orders and conducting blowout campaigns on the phone or on the road. This responsibility makes sales a more valuable asset within the business relationship and a more essential element in building the partnerships of the future.